A call center setup is not complete without good outbound dialers to make an intelligent customer outreach. But before picking an outbound dialer, it is essential to understand the needs of your business and zero in on the features that you need to make your outbound campaign effective and result-oriented. With the help of cloud technology, the dialers have become more efficient with time, and the contemporary dialers are highly customisable and intelligent in terms of using customer data. We will discuss about outbound dialers in this write-up and also how to pick one that suits your call center needs. Cloud-based manual dialer needs manual effort to dial the numbers and the agents have to click on the computer screen to dial the next number. The computer interface is so user-friendly that the agents don’t need any kind of training to use it. The agents remain totally free to choose and dial a number. So, an agent can easily find specific customer information in the CRM, and depending on the previous conversations the agents can have first-hand insights before speaking with the customers about his needs or the product or services he might be interested in. The agent gets enough time to do his homework and, they can plan the call as suitable. Auto dialer brings autonomy to the agents. When the file with the contact leads is uploaded to the auto dialer, it automatically dials those uploaded contact numbers after pressing the dialing button. As soon as, a customer takes the call, it automatically redirects the call to the available agents. An auto dialer is a good tool when it comes to making outbound calls in bulk, after uploading the file of leads. It works very efficiently because it automatically dials the numbers one by one. As soon as a live person picks up the call, the call is routed to an available agent. It reduces the efforts needed from the agents substantially and also makes the customer-agent connection much higher in number. Predictive dialer is the most sophisticated and refined form of the dialer. It uses the customer data to make the outbound calls highly precise, and result-oriented. While setting up an outbound campaign, the user can easily set up the time-zone and call rate to tap into the possibility of a higher number of connections. The biggest benefit that comes with predictive dialer is that it works on an algorithm that enhances the possibility of a customer-agent connection. The algorithm makes use of the average handling time of the individual agents. Moreover, it gives a perfect timing to the dialer to make the outbound calls so that it becomes more likely that there is always an available agent for a customer over the line. The timing of the outbound call can be in accordance with the time-zone and the call rate according to the number of agents. These customisable attributes of the dialer make it more likely that the customer would take the call. In addition to this, there are other benefits as well that come with predictive dialers. Such as integration of CRM (Customer Relationship Management), and other business applications that make it a complete outbound dialing solution. 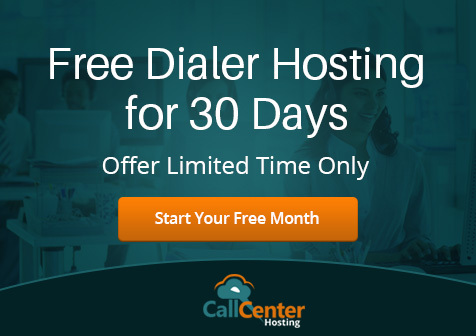 Since all the three dialers work on cloud technology, so they complete the call through servers and easily overcomes the traditional telephony limitations. Moreover, cloud technology brings in various other benefits like scalability, flexibility, and portability with it to get more business prospects. It makes the idea of cloud-based dialers highly versatile for the contemporary call center needs. How to Pick a Right Dialer? The size of a call center is defined by the number of agents. So, if the number of agents is less, manual dialer can fulfill the needs. However, if one wants to reduce the agents’ efforts, then auto dialer comes into the picture. 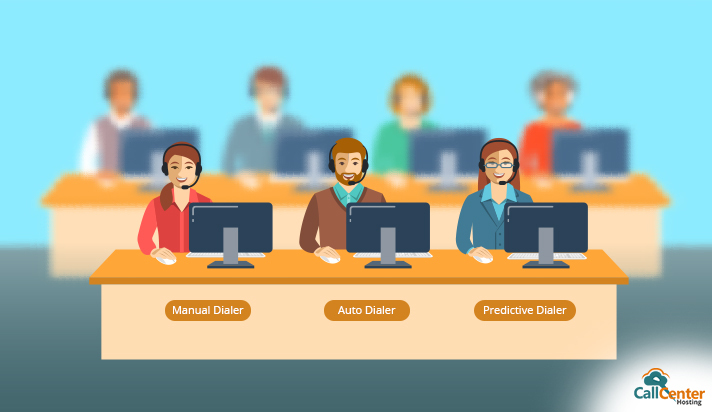 A call center that has more than ten agents can get benefitted by the predictive dialers, however, using a predictive dialer with a fewer number of agents may keep the customers waiting for an available agent. If the customer base is spread across various continents, then a dialer with time-zone setting is a better option. Type of leads is also an important factor while designing a campaign on a dialer. In addition to this, once the customer contact has been made, lead generation and closing the call on a positive note needs a certain approach. It includes right timing of the outbound call, lead management, frequent communication with the customers and also not intruding their space to connect with them over a phone call. After all, a dialer fulfills its purpose only if the call is taken by the customer. Make sure that you have thought over the necessary points already before making that call, that very first attempt to connect with a prospective customer.